When dreaming of a backyard transformation, it is easy to get carried away imagining every single item you would like to incorporate. Since dream dollars aren’t ever connected to a real bank account, the swimming pools seem to be bigger, the sound systems have sub-woofers and the fire pits are something out of a high school movie bon fire. However, when the day dream is finally over, it is time to come back to reality to rationalize which features actually belong in our outdoor living spaces. Yes, a fire or a hot tub is nice…but does it really belong in your backyard? Hot tubs are nice, especially for sore muscles or a long soak in the cooler weather, but hot tubs are not the most cost effective outdoor feature if you are not going to get constant enjoyment from them at your home. If you plan on relaxing in your hot tub at least once a week or 2-3 times a month…do it! You will reap the benefits of this outdoor feature and all the gratification that comes along with it. However, if you only see using your hot tub on occasion or firing it up during that 1 big bash you throw every year, the purchase of this water feature may not be for you. Instead, opt to draw a hot bath inside to relax when you need to and allocate the money saved for the hot tub to a different feature that you would receive more benefit from. 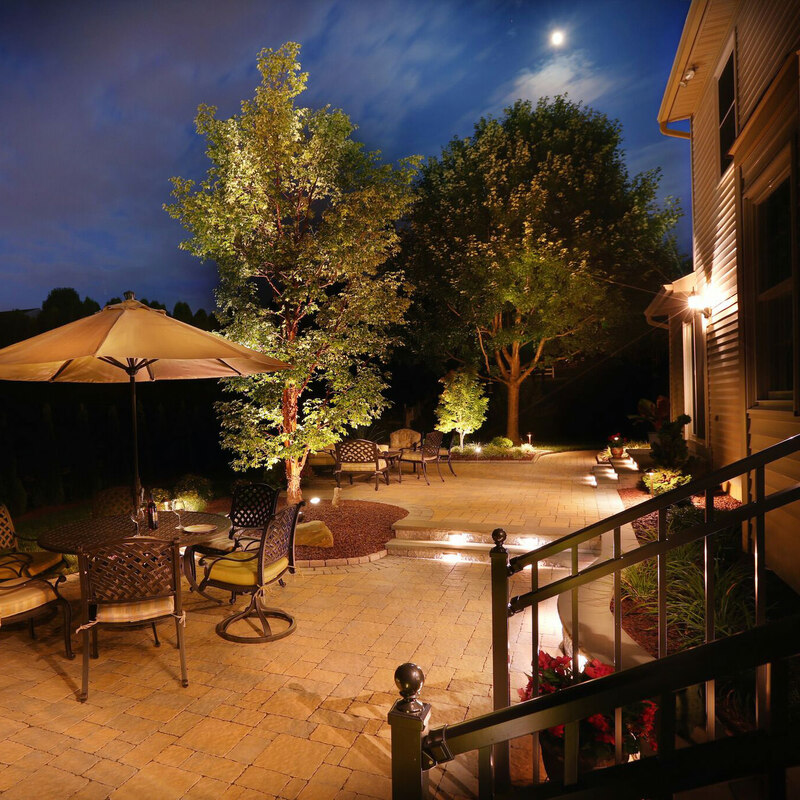 Perhaps you would like to install warm LED landscape lighting around the property for safety and ambiance or maybe it would make the most sense to install a water feature near the back patio to listen to tranquil trickling water in the evening. Whatever the alternate feature may be, be sure that it will be a benefit to your property instead of sitting on the sidelines waiting for attention. Permanent fire pits are always a topic of conversation when planning a new outdoor living space. Masonry fire pits, both wood burning and gas-fueled are the perfect addition to the backyard after a day of fun in the sun during the summer and during the chill of autumn nights, but before asking your landscape designer to include it in your plan, truly ask yourself how often you think you will be firing it up. 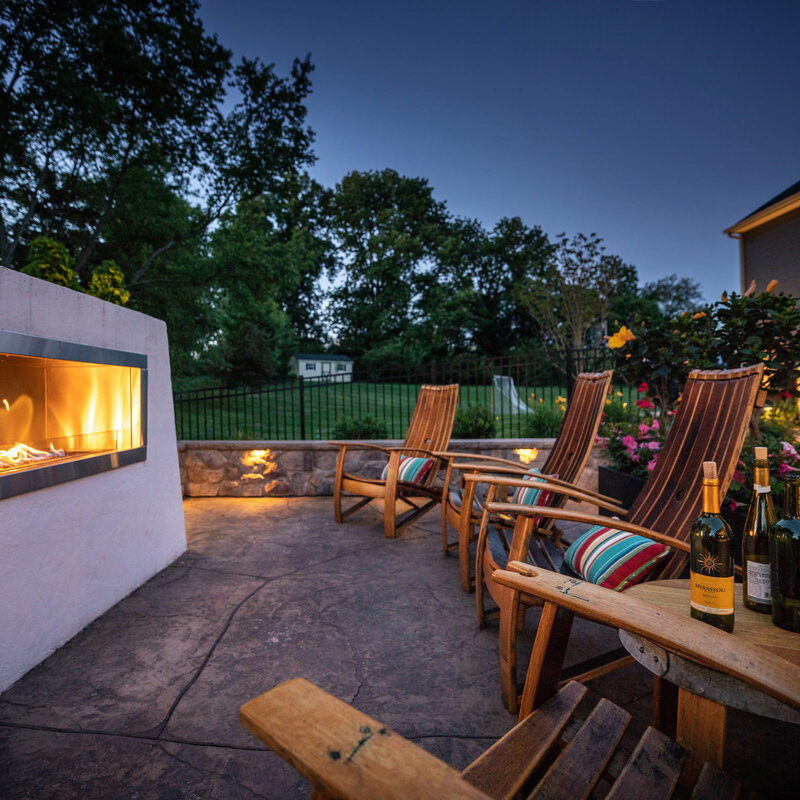 If you plan on using the fire pit at least once a week with your family and friends, it makes perfect sense to include this feature in your backyard transformation! If you don’t see yourself feeding the fire pit as often, it might make the most economical sense to purchase a fire table or portable fire pit. Not only will you save yourself some dough, but you will then have the option to move it wherever you would like in your outdoor living space. Portable units are great for smaller spaces or for those who like to change the layout of their entertainment space often. Smaller party? Bring the fire feature on the patio for everyone to sit around and enjoy. Larger party? 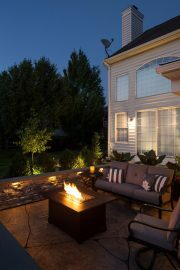 Relocate the fire feature out of the way or in the yard to leave the hardscaped space for foot traffic…maybe some dancing! For those who love the sunshine, but hate the intense mid-day sun and heat, roof systems are the perfect option. Whether the build and style of your home call for an A-frame or lean-to, you are sure to beat the heat taking respite underneath. Concerned about blocking the light to the inside of the home? No problem! Incorporating skylights is the perfect solution to allow natural light to the covered patio or deck area below and to allow the natural light to flow back into the house. Building a covered area off of the back of the home to seamlessly transfer from inside to an outside dry space is invaluable. However, there are some instances when it doesn’t make as much sense to incorporate a roof system directly off the back of the home. Homes that have existing solariums or sunrooms provide the same effect that a roof in the backyard would provide, making a new roof utterly superfluous. There are also certain townships that do not allow attached structures to protrude “x” amount of feet into the yard! While township code enforcement rules vary from town to town, sometimes it makes more sense to alter your plans than to apply for a variance. Pavilions, pergolas and gazebos are the perfect solution for those who desire a shaded area, but not necessarily directly off of the home. 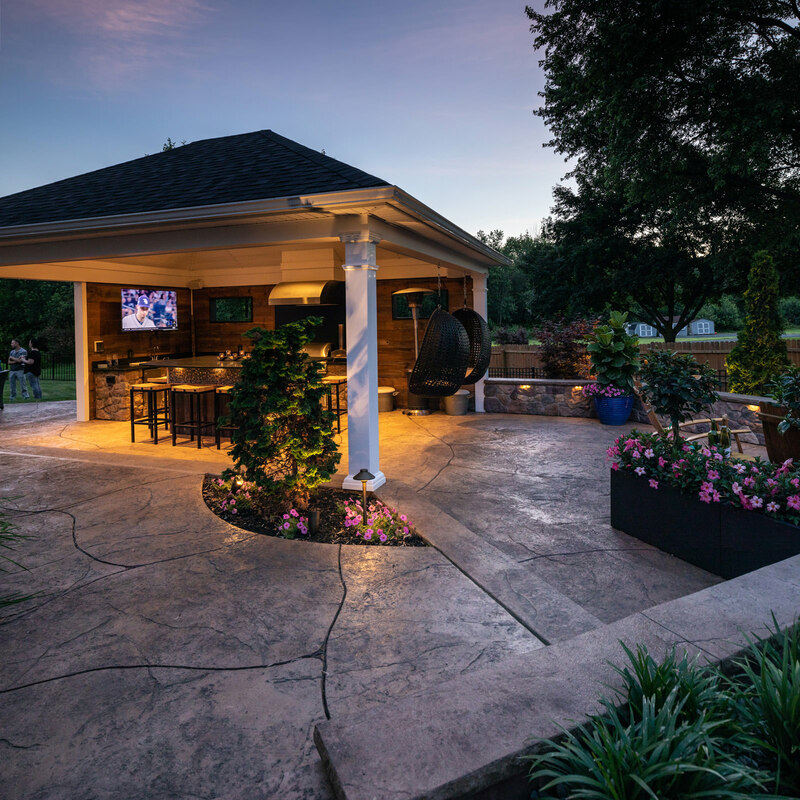 Outdoor kitchen areas have been growing in popularity and have become one of the most sought-after features in the backyard. Outdoor kitchens are completely customizable to include any features desired like refrigerators, ice makers, grill tops, burners, storage…you name it! Hosts and entertainers value outdoor kitchens because it allows them to still be in the mix of the party when preparing meals or pretending to be Tom Cruise shaking up their cocktails. However, can you justify such a permanent feature if you don’t grill outside very often? No matter how modest or mega the outdoor kitchen area, if it isn’t going to be appreciated and used regularly, your money is best to be used elsewhere. For homeowners that don’t entertain or cook outside often, opting for a designated area for the grill and tabletop can be room enough. So before asking your landscape designer to include a masonry pizza oven right next to the Big Green Egg that is situated alongside a 6-rack meat smoker, ask yourself if it is worth the investment, or can you gain enjoyment in another way in your outdoor living space. If you think about it, while computers may be efficient and help us in our day to day, you must remember that they do not have a heart and will spend every dollar that you have. So, before asking your landscape designer to design a backyard living space with every single outdoor feature you have seen on HGTV for the past 5 years, make sure that you will utilize the features on your wishlist. Being honest with yourself and your designer will save you time and money in the long term. Working smarter is an ideology at MasterPLAN Landscape Design, which is one of the many reasons we like to partner with our clients along the journey of their backyard transformations. 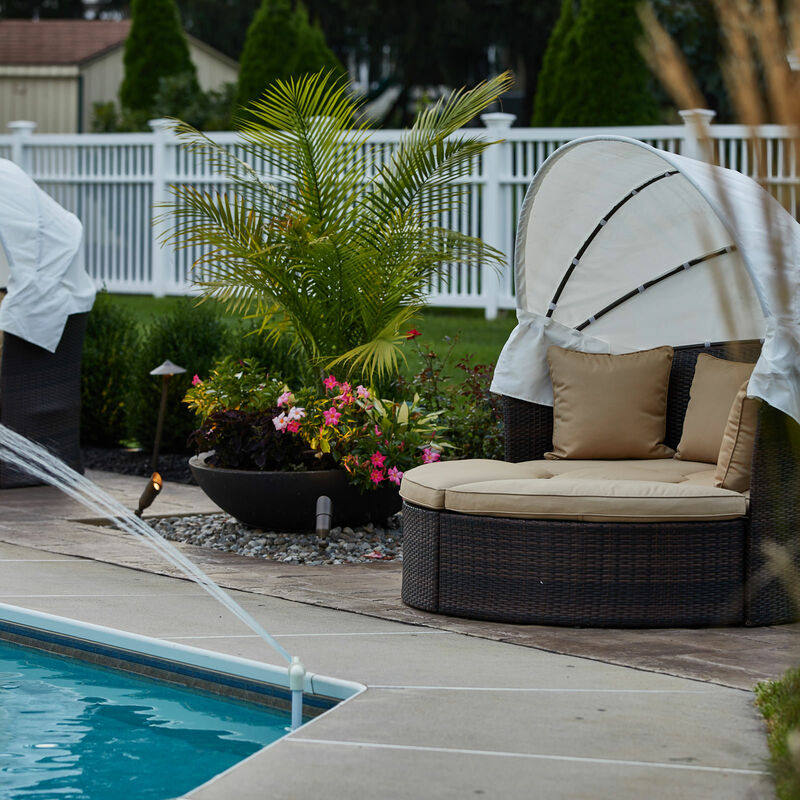 We believe that an outdoor living space is much more than a pool, deck or patio; your backyard is essentially the backdrop of your life…where birthday parties and prom photos happen, where first steps are taken and laughter is shared. We aim to spend the proper amount of time with each client to decide which features make the most sense for their family and custom-tailor their living space to their own needs. 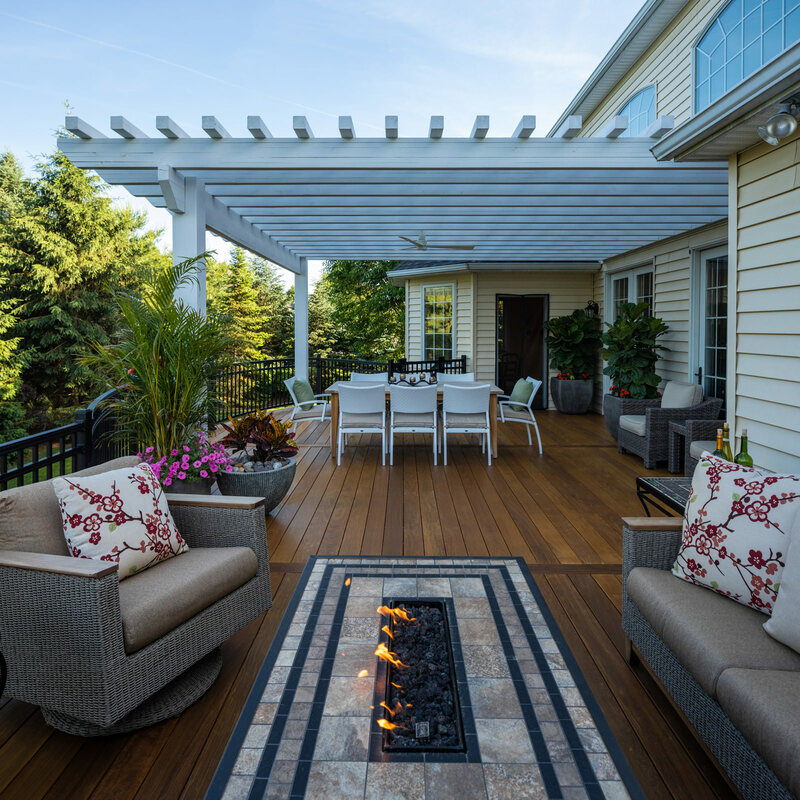 Beauty and function go hand-in-hand with all MasterPLAN outdoor living spaces, and we would love to help you uncover what makes the most sense for your family and your property. If you would like to chat about the full potential of your property for years of enjoyment, reach out to us at MasterPLAN; we would love to welcome you into the MasterPLAN family!